Missouri Lawyers Media selected Seyferth Blumenthal & Harris LLC (SBH) Managing Member Kimberly Jones for the inaugural class of its Diversity & Inclusion awards. She will be honored, along with 18 other individuals and one law firm, during a ceremony Wednesday, Aug. 15, at the Missouri Botanical Garden in St. Louis. SBH Partner Charlie Harris will serve as the featured speaker at the ceremony. The inaugural Diversity & Inclusion Awards are meant to honor attorneys, firms and organizations from around the state for working to support and advance those initiatives “and the dignity of all people in Missouri’s legal profession and in communities in which exceptional legal work impacts justice for all.” A selection committee, assembled from members of The Missouri Bar and statewide legal leaders, worked with Missouri Lawyers Media to review nominations and select the honorees. 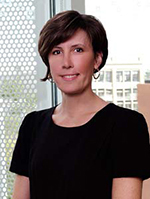 In addition to her accomplished work in the legal industry, Kim has remained very active in the community, serving on several boards and committees, including Mid-America Gay & Lesbian Chamber of Commerce Board of Directors, Vice Chair of the Women’s Employment Network Board, and the Heartland Labor and Employment Law Institute Steering Committee, among others. Kim has served as managing member at SBH since 2016.